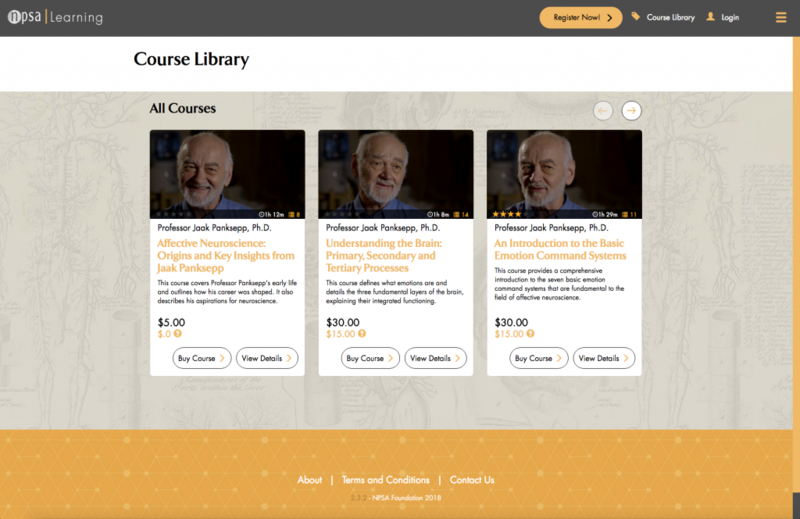 See five new courses from our dear late friend Jaak Panksepp, on the new NPSA Learning platform. The series was recorded and produced by Richard Astor, Bonny Astor, and Chester Kaplan. Jaak spent much of his career as a distinguished professor at Bowling Green State University, in Bowling Green, Ohio. You can honor his memory by making a donation to the J.P. Scott Center for Neuroscience, Mind, and Behavior. (A colleague recalled that Jaak was very insistent that the word “mind” be included in the Center’s name when it was first founded!) Visit the donations page at BGSU, and then use the search words “Scott Center” to designate your donation. Another way to honor Jaak’s scientific contributions is to contribute to a new Panksepp Research Prize to be awarded by The Neuropsychoanalysis Association. Matching funds will increase your donation towards this prize, which will be awarded to an early or mid-career researcher for outstanding work in affective neuroscience. To make a donation, please click here.